These aren't the first new potatoes of the year, we dug those over a week ago, then got drunk and failed to eat them. They're not even picked today, these are the ones I took on the 12th and ate then but I cleared the rest of the row yesterday to make a space now newly populated with courgette plants. 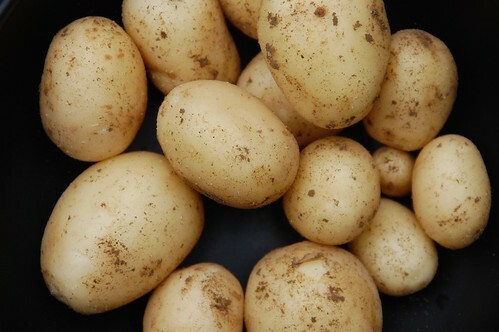 Ordinarily the first new potatoes take a headline position on the blog. It's always exciting to pull the first substantial crop of the year and these potatoes with all the troubles that beset them in the way of late planting and nasty cold spring should be worth a little more ceremony and fanfare but to be perfectly honest they're not that great. The variety is Swift and it surely is, we've been able to dig potatoes in as little as seven weeks from planting in a good year so we usually have few just to make sure we can boast of our good fortune as often as possible but I'm beginning to think that speed isn't everything. Next year, if we live that long, I think I'll go for one of the more flavourful first earlies, Epicure or Duke of York. Trouble is, we've tried both of those here and they don't seem to like the soil, so perhaps some experimentation will be needed.